Storey Publishing, LLC, 9781612124278, 160pp. Permaculture is a sustainability buzzword, but many people wonder what it actually means and why it is relevant. Originally coined by combining the words permanent and agriculture, permaculture has evolved into an optimistic approach connecting all the systems of human life: gardening, housing, transportation, energy, and how we structure our communities. The Permaculture Promise explains in simple terms why permaculture may be the key to unlocking a livable future on our planet. Author Jono Neiger asserts that humans can thrive while simultaneously making Earth healthier and not destroying it. The book shows 22 ways that permaculture can create a better future for all living things. Profiles of people and communities — including an urban dweller who tore up her driveway to create a vegetable garden and a California housing development that dedicates a third of its land to parks, orchards, and gardens — will inspire you to incorporate permaculture principles into your life today. 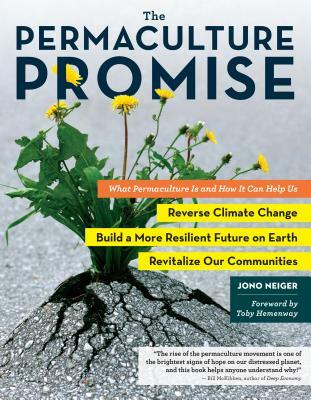 Jono Neiger is the author of The Permaculture Promise. He is a conservation biologist, a permaculture educator, and a designer. He is a principal at the permaculture design and consultation firm Regenerative Design Group, and he is on the faculty of the Conway School of Landscape Planning and Design. Neiger works to help organizations and individuals further their goals for stewarding their land and to create productive, regenerative human ecosystems. He lives in Leverett, Massachusetts. Toby Hemenway has been an adjunct professor at Portland State University and Scholar-in-Residence at Pacific University. He is the author of The Permaculture City and Gaia’s Garden, which won the 2011 Nautilus award and was named one of the ten best gardening books of 2010 by The Washington Post. His writing has appeared in magazines such as Natural Home, Whole Earth Review, and American Gardener. Toby and his wife, Kiel, live in Sebastopol, California.